Joel entered the ONE80TC program in May, 2017. A fully qualified carpenter, Joel turned to alcohol to overcome depression. But, rather than help, it ruined his life. He turned to ONE80TC in the hope of renewing his passion for life. 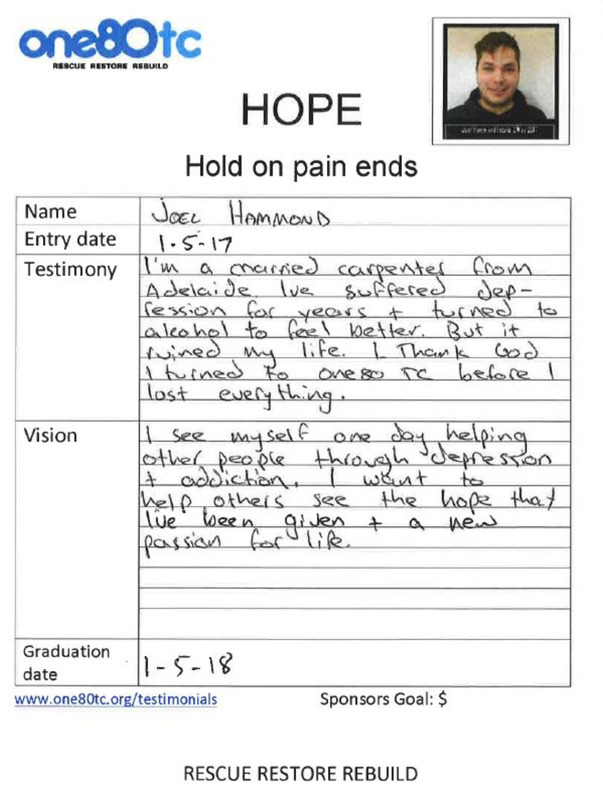 It costs approximately $50,000 to put a student through our full time 12 month residential program and Joel has generously offered his story to help gain support. Please click one of the following riders to pledge support for Joel and the amazing group of guys that have come with them. Bernard Norton (Target $4,000) Click here to sponsor me. Brad Moses (Target $2,500) Click here to sponsor me.